O God, who hast honoured this day by the Birth of Blessed John the Baptist: grant thy people may rejoice in spirit, and guide them in the way of eternal salvation. Through thy Son our Lord Jesus Christ, who liveth and reigneth with Thee, in the unity of the Holy Ghost, God, world without end. Amen. Our life with discord stain. It gain’d its former sound. Be equal glory, equal praise. For endless years and days. Amen. V. There was a man sent from God. R. Whose name was John. LESSON – Isaias, xlix. 1-7. Give ear, ye islands, and be attentive to me, ye people afar off. The Lord called me from the womb, and from the bowels of my mother hath he called to mind my name. He made my mouth like a sharp sword: under the shadow of his hand hath he protected me, and made me as a chosen arrow; in his quiver hath he hidden me. And he said to me: Israel, thou art my servant; for in thee will I be glorified. And now saith the Lord, who formed me from the womb to be his servant; Behold I have made thee a light to the Gentiles, and my salvation even to the ends of the earth. Kings shall see, and Princes rise up and adore for the Lord’s sake, and the Holy one of Israel, who hath chosen thee. GOSPEL – St. Luke i. 57-68. Elizabeth’s time of being delivered was come, and she brought forth a son. And her neighbours and kindred heard how the Lord had shown his great mercy towards her, and they congratulated with her. And it came to pass, that on the eighth day they came to circumcise the child; and they called him Zacharias after his father’s name. And his mother answering, said: No, but he shall be called John. And they said to her: There is none of thy kindred that is called by that name. And they made signs to his Father, to know how he would have him called. And he, asking for a writing table, wrote, saying: John is his name. And they all wondered: and immediately his mouth was opened, and his tongue loosed; and he spoke, blessing God. And fear came upon all their neighbours; and all these things were noised abroad through all hill-country of Judea. And all that heard them laid them up in their hearts, saying: What think you, will this child be? For the hand of the Lord was with him. And Zacharias his father was filled with the Holy Ghost, and he prophesied, saying: Blessed be the Lord, the God of Israel, for that he hath visited, and wrought the redemption of his people. Blessed be the Lord God of Israel, because he hath visited and wrought the redemption of his people: And hath raised up a horn of salvation to us, in the house of David his servant. As he spoke by the mouth of his holy prophets, who are from the beginning : Salvation from our enemies, and from the hand of all that hate us. To perform mercy to our fathers; and to remember his holy covenant. The oath which he swore to Abraham our father, that he would grant to us. That being delivered from the hands of our enemies, we may serve him without fear: In holiness and justice before him, all our days. And thou, child, shalt be called the Prophet of the Highest: for thou shalt go before the face of the Lord, to prepare his ways: To give knowledge of salvation to his people, unto the remission of their sins: Through the bowels of the mercy of our God: in which the Orient from on high hath visited us: To enlighten them that sit in darkness, and in the shadow of death: to direct our feet in the way of peace. The Voice of one crying in the wilderness: “Prepare ye the way of the Lord; behold thy God!” (Isaias, xl. 3-9) Oh! in this world of ours grown now so cold, who can understand earth's transports, at hearing these glad tidings so long expected? The promised God is not yet manifested; but already have the heavens bowed down, (Ps, xvii. 10) to make way for his passage. No longer is He “the One who is to come,” He for whom our fathers, the illustrious saints of the prophetic age, ceaselessly called, in their indomitable hope. Still hidden, indeed, but already in our midst,—He is resting beneath that virginal cloud, compared with which, the heavenly purity of Thrones and Cherubim wax dim; yea, the united fires of burning Seraphim grow faint, in presence of the single love wherewith she alone encompasses him in her human heart,—she that lowly daughter of Adam whom He hath chosen for His mother. Our accursed earth, made suddenly more blessed far, than yonder heaven inexorably closed erstwhile to suppliant prayer,—awaits no longer aught, save that the august mystery be revealed; the hour is come for earth to join her canticles to that Eternal Praise Divine, which henceforth is rising from the depths, and which being itself no other than the Word Himself, celebrates God condignly. But beneath the veil of humility where His Divinity, even after as well as before His birth, must still continue to hide itself from men,—who may discover the Emmanuel?—who, having recognised Him in His merciful abasements, may succeed in making Him to be accepted by a world lost in pride?—who may cry, pointing out the Carpenter's Son, (St. Matth, xiii. 55) in the midst of the crowd: Behold Him whom your fathers have so wistfully awaited! For such is the order decreed from on High, in the manifestation of the Messias: conformably to the ways of men, the God-Man will not intrude himself into public life; he will await, for the inauguration of his divine ministry, some man who has preceded him in a similar career, and who is hereby sufficiently accredited, to introduce Him to the people. St. Austin observes that the church usually celebrates the festivals of saints on the day of their death, which is in the true estimate of things their great birthday, their birthday to eternal life. The same father adds, that the Nativity of St. John the Baptist is excepted from this rule. The reason of which distinction is, because this saint was sanctified in his mother’s womb (St. Luke, i. 15, 41), so that he was brought forth holy into the world; which St. Bernard and many eminent divines understand not only of an external sanctity, or deputation to piety, but of the gift of sanctifying grace by the remission of original sin, which they doubt not to have been imparted to him by the presence of our divine Redeemer in the visit made by the Blessed Virgin to St. Elizabeth. Moreover, the birth of the precursor of our Divine Saviour was a mystery which brought great joy to the world, announcing its redemption to be at hand; it was in itself miraculous, and was ushered in with many prodigies. God, who had often distinguished the birth of great prophets by signs and wonders, was pleased, in an extraordinary manner, to honour that of the Baptist, who, both by the dignity of his office, and by the eminent degree of grace and sanctity to which he was raised, surpassed, according to the oracle of truth itself, all the ancient patriarchs and prophets. His father Zachary was a holy priest of the family of Abia, one of the twenty-four sacerdotal families into which the children of Aaron were divided, in order that they might all serve in the temple by turns. Elizabeth, the wife of this virtuous priest, was also descended of the house of Aaron, though probably her mother was of the tribe of Juda, she being cousin to the Blessed Virgin. The Holy Ghost assures us that Zachary and Elizabeth were both just, by true virtue, not by an imperfect or false piety, which is scrupulous in some points only the better to cover certain favourite passions; which hypocrisy may often obtain the deceitful suffrage of men, but can never be pleasing in the divine eyes. The virtue of these saints was sincere and perfect, “And they walked in all the commandments and justifications of the Lord without blame.” So impenetrable are the foldings of the human heart, that we have reason to fear the disguise of some secret passions even in our best actions. But blessed are they whom God commends. Zachary lived probably at Hebron, a sacerdotal town in the western part of the tribe of Juda, in the hilly country, about twenty miles from Jerusalem. David, when he appointed the service of the temple that was to be built, divided the priests into twenty-four courses, who were to officiate in the temple by turns, each a week at a time. Among these that of Abia was reckoned the eighth in the time of David. It was usual for the priests of each family or course, when it came to their turn, to choose by lot among themselves the men who were to perform the several parts of the service of that week. It fell to the lot of Zachary, in the turn of his ministration, to offer the daily morning and evening sacrifice of incense on the golden altar, in the inner part of the temple, called the Sanctum, or sanctuary; which sacrifice was prescribed as an emblem of the indispensable homage which all men are bound to pay to God of their hearts, by morning and evening prayer. It happened that while Zachary was offering the incense one day for this sacrifice, and the people were praying without the sanctuary, he was favoured with a vision, the Angel Gabriel appearing to him, standing on the right side of the altar of incense. Zachary being struck with exceeding terror and amazement, the angel encouraged him, assuring him that his prayer was heard, and that in consequence thereof, his wife, though she was called barren, should conceive and bear him a son; adding, “Thou shalt call his name John, and he shall be great before God.” He did not call him great in the world, in honours, in riches, or applause; these false titles being mere emptiness and smoke; fraught with snares and secret poison. Nor did he say he would be great in the deceitful judgment and foolish opinion of men, who not knowing things as they are in themselves, seldom weigh them in a just balance, and often give them names contrary to what they ought to bear, calling darkness light, and that which is bitter, sweet. But he who is great before God is great indeed. The praises of our saint are truly admirable, because bestowed on him by the sovereign Truth; they exceed all other commendations. His matchless excellency was intimated by the name which was given him by heaven; for he was called John, which word signifies one filled with grace. John was chosen by God to be the herald and harbinger of the world's Redeemer, the voice to proclaim to men the eternal Word; the morning star to usher in the Sun of justice, and the Light of the world. It was therefore becoming that he should be adorned with all virtues in an heroic degree. Other saints are often particularly distinguished by certain characteristical privileges; but John eminently excelled in graces, and was a doctor, a virgin, and martyr. He was a prophet, and more than a prophet, it being his office to point out to the world Him whom the ancient prophets had foretold obscurely, and at a distance. His spotless innocence, his unparalleled penance, his spirit of prayer and retirement, his zeal, and charity, were wonderful: but the crown of his greatness was his profound humility. An early piety, and an innocence which was never defiled by any stain of sin, is a precious grace; and the first-fruits of a heart are particularly due to God, and a sacrifice most agreeable to him. Therefore the angel ordered that the child should be consecrated to God from his very birth, for an exterior mark of his holy destination; and for an emblem of the necessity of leading a mortified life in the practice of virtue, this heavenly messenger enjoined that he should never touch wine or any other intoxicating liquor. The angel added, that he was holy, and filled with an extraordinary measure of grace by the Holy Ghost, even from the womb of his mother. By this extraordinary sanctity was the Baptist prepared to take upon him the high function of a preacher of penance, in order to convert the degenerate children of Israel from sin to godliness, to unite their hearts by the practice of piety to the holy patriarchs their ancestors, and to make them a perfect people to the Lord, that they might be disposed to receive the salvation which Christ brought them—for John was chosen to walk before Him, in the like spirit and power with which Elias will appear, to prepare men for His second coming to judge the world. That the miracle of the Baptist's birth might be more evident, Elizabeth was at that time advanced in years, and, according to the course of nature, past child-bearing. God had so ordained it, that this saint might be the fruit of long and earnest prayer, the ordinary channel of his graces. By this circumstance parents are admonished with what assiduity and fervour they ought to address themselves to God to obtain his blessing upon their offspring. Zachary was amazed at the apparition, and at the wonderful things he heard, and begged a sign might be given him which might ascertain to him the effect of these great promises. The angel, to grant his request, and at the same time to show he might have reasonably acquiesced in the marks given him in the vision itself, answered, that from that moment he should continue dumb till such time as the child was born. On the following Sabbath-day the week of his ministration expired, after which he returned home. Elizabeth conceived, and in the sixth month of her pregnancy was honoured with a visit from the mother of God, in which, at the presence of the world's Redeemer, the Baptist was sanctified yet in his mother's womb. On this occasion, the blessed child, yet unborn, was, by an extraordinary privilege, favoured with the use of reason; was the first among men who beheld Christ, and knew him before he saw the light with his corporeal eyes. Inexpressible was the miraculous joy with which his soul was overwhelmed to behold him present, whom the ancient prophets rejoiced so much only to foresee in spirit. Whence it is added, that he leaped for joy in the womb. 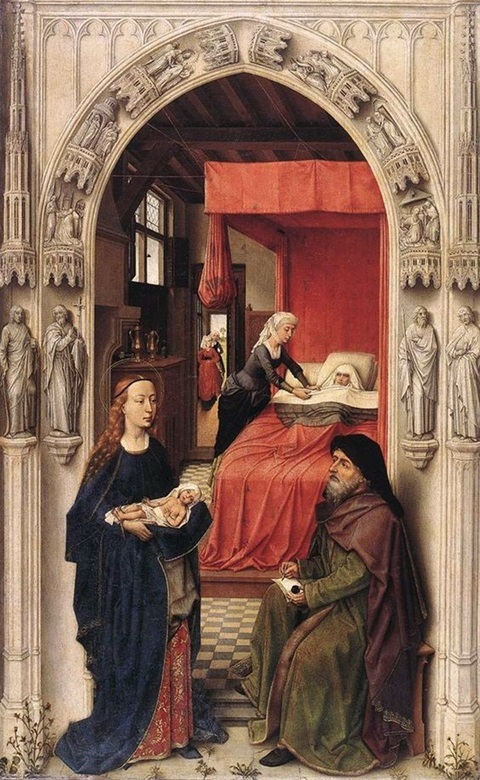 Elizabeth, after nine months, brought forth her son, who was circumcised on the eighth day. On that occasion the rest of the family were for having him called by his father's name, Zachary; but the mother, by divine inspiration, said his name should be John. The father confirmed the same by writing, and immediately recovering the use of his speech, broke out into the divine praises in the most profound sentiments of love and thanksgiving, and joyfully proclaimed the infinite mercy with which God in his most tender bowels was pleased to visit his people of Israel, and the nations which were seated in the shades of death. In the like fervent dispositions of gratitude and praise ought we to recite with the church the inspired canticle [The Benedictus] of this holy prophet. We possess the infinite treasure of divine grace in frail vessels, and walk continually upon the brink of precipices, and amidst rocks and dangers; therefore we are bound always to fear, and to use the utmost caution, lest we fall, and lose this most precious of all excellent gifts. To teach us with what watchfulness and care we are bound to preserve, and earnestly labour continually to improve it by an humble and penitential life, by assiduous prayer, by an application to the practice of all good works, and a scrupulous flight of dangerous occasions, the Baptist was inspired by the Holy Ghost to retire in his tender years into the wilderness. There he devoted himself to the exercises of holy prayer, leading a most austere penitential life. His garment was of a rough camel’s hair, girt about him with a leathern girdle, and he allowed himself no other food than what he found in the desert, wild honey and locusts. These are a kind of large grasshoppers, and are used in those countries as a coarse food when dressed, but St. John ate them raw. Of this his retirement Origen writes: “He went into the desert, where the air was more pure, the heavens more open, and God more familiar, that, till the time of his preaching was come, he might employ himself in prayer in the company of angels.” And again, “He had neither scrip nor servant, nor so much as a poor cottage to shelter himself in from the inclemency of the weather. He remained in the desert, even when he began to preach penance.” St. Jerom writes, “Neither the tenderness nor the riches of his devout parents could hold him in their plentiful house amidst dangers from the world. He lived in the desert, and disdained to behold other things with eyes which coveted to see Christ. His raiment was coarse, his food locusts and wild honey; all which things are conducive to virtue and continency.” This frightful solitude he chose for his dwelling, lest the purity of his heart should be sullied if he had entertained any commerce with men; and his penance was most austere, because the path of innocence and virtue is that of the cross or of mortification. How loudly does his penitential youth condemn those pretended Christians whose life is altogether earthly, and who, instead of curbing their inclinations, and keeping their senses in due subjection, study by softness and pleasure to gratify them almost in everything. They renounce for ever the happiness which Christ has promised to his followers, who do not take his word and actions for the only rule of their conduct. St. John by his retirement calls upon us to disengage our hearts from the ties of the world, and frequently to imitate in our closet his exercises in the wilderness. The world is like a perspective, which can only be seen in the true point, of light at a distance. By holy retirement, and by conversing often with heaven, the fascination of its enchantments will fall from before our eyes, and we shall see that it has nothing which ought not to be to a Christian heart an object of contempt, abhorrence, or dread. It is made up of vanity, danger, and sin. Its goods and enjoyments are short-lived and uncertain, and in themselves false and empty; its pains real and grievous; and its promises treachery and deceit. It is now so worn out, and its cheats are so clearly discovered by long experience, according to the observation of St Austin, that it ought long ago to have lost its false painted charms. Gerson compares those who seek for happiness in it to fools who should with great pains seek for roses and tulips on nettles and briers, which, instead of yielding flowers, can only prick and wound their hands. It is covered with a thick darkness, which intercepts the sight of heavenly things; it is filled with snares in every part, and its vanities and pleasures are fraught with deadly poison. We must enter it with a holy fear, must converse in it with watchfulness, and continually fortify our souls against the infection of its air by the antidotes of frequent meditation, prayer, and self-denial, according to the excellent advice of St Francis of Sales. Thus shall we learn to live in the world so as not to be of it, to use it as if we used it not, and possess it so as not to be possessed or captivated by it. The child that is born to us, is more than a Prophet: for this is he of whom the Saviour saith: Among the born of women there hath not risen a greater than John the Baptist.